Have you been looking to learn how to Penetration Test? 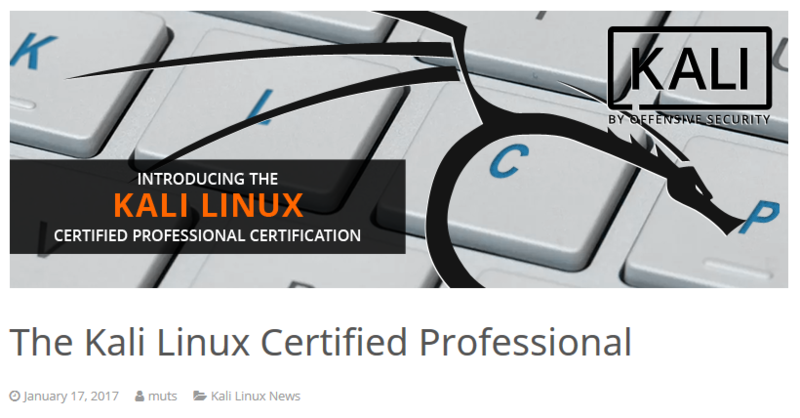 Muts and crew have announced a new, free course and certification called Kali Linux Certified Professional. The KLCP can be your stepping stone to a career in Pen Testing, or can bring you up to speed on some of Kali's capabilities. If you're a network or systems administrator, you can use this information to secure your infrastructure. If you haven't heard of Kali Linux, it is a free Linux Distribution specifically designed for Penetration Testing. It is loaded with tools you can use to test your network and find vulnerabilities before the black hats do, so you can fix them. Whether you're an aspiring Pen Tester, or a network or system administrator who wants to better protect your infrastructure, I strongly encourage you to have a look at this course and to learn Kali. If you're beyond the basics, have a look at the Offensive Security Certified Penetration Tester course and certification. Hey, with super cool images and videos like that, how can you go wrong? for the KLCP course. Also, a bit more about the course. Pearson VUE site to sign up. Using Fingerprints At Food Kiosks? There Are Risks.